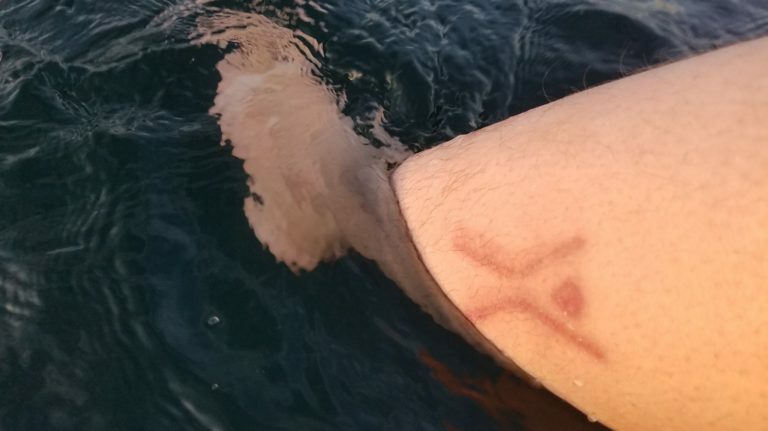 I’m a huge fan of body mods and over the summer this year, I finally had the opportunity to do a body modification that I’ve had my eye on for many years – I got branded! I’m really interested in scarification because it looks really appealing, it’s not super common and it interacts with your body in an interesting way as it heals. 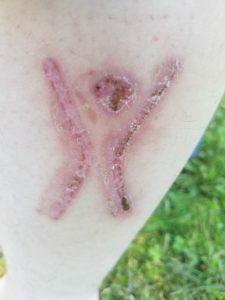 After I got it done, I was looking online for information on how to take care of it or what it should look like during different stages of the healing process, but I was a little surprised by how little information there was out there! 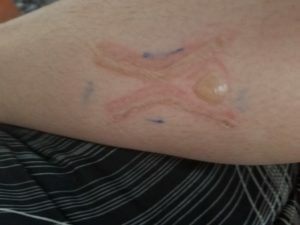 I still made it through a speedy recovery but I kept thinking it would have given me a lot of peace of mind to see that it was healing at more or less the rate it should, so I decided to track my entire healing process and put it out there publicly for other people experimenting with this type of scarification in the future. If that’s you, hello and welcome! I hope this is helpful! Day 0. 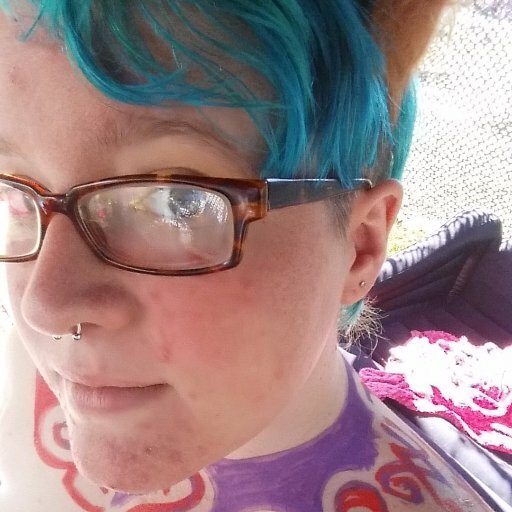 I found out I was going to have a chance to get my brand done on Sunday morning at a Burning Man regional event and we planned to do it in the early evening, so I had the whole day to look forward to it and psyche myself up! 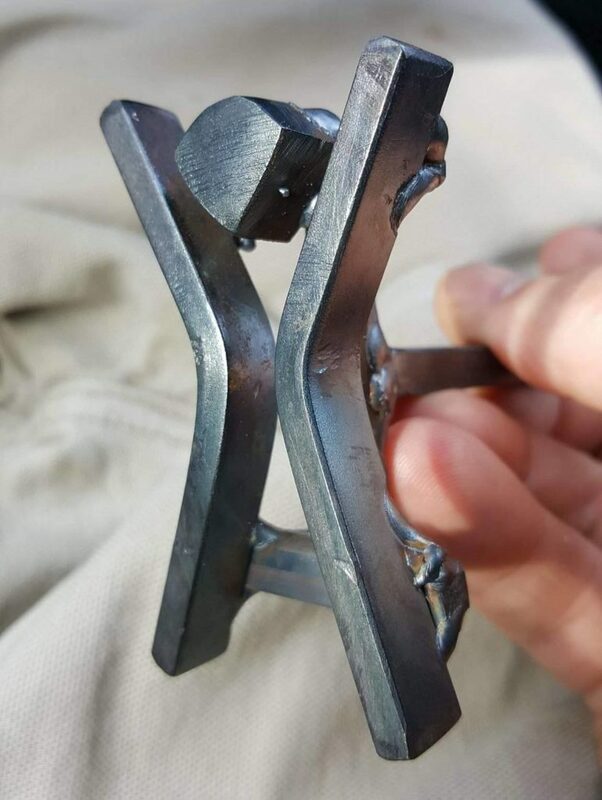 We did it with a hot brand that was heated up using a small kerosene stove. 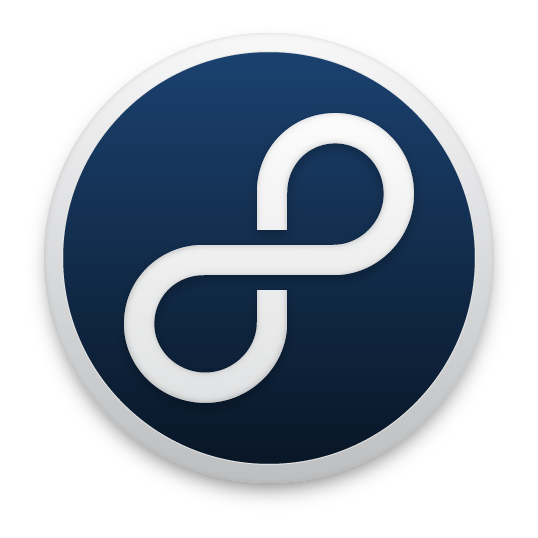 Originally I wanted to put it on my hip, but decided it would be too hard to heal if it was too close to my waistline. I decided to put it on my leg. 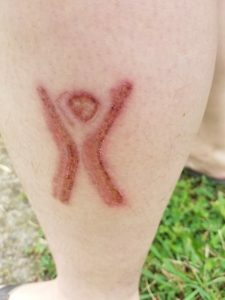 I wanted it on the back of my calf but was told that wasn’t a good place because the curve of my muscle would prevent the entire brand from touching my skin at the same moment like it has to, so it ended up going on the side of my calf where it’s flatter. I was a little scared because I knew it was going to be an intense experience. 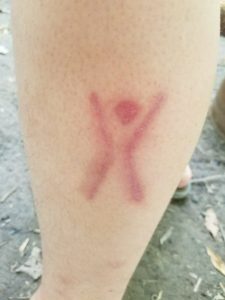 It was intense, but not as extreme as I was expecting because it was over so quickly – the brand was touching my skin for less than a second. 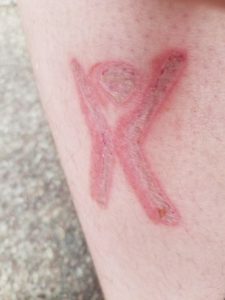 After the brand came off, it still hurt but not in the same searing kind of way, plus my adrenaline was flowing at that point. Here’s what it looked like immediately after being done. The first night, I put pain relieving neosporin on it and covered it with gauze and medical tape. It definitely ached for the rest of the night, especially when I put weight on that leg, but it wasn’t bad enough to stop me from walking around or anything. Day 1. 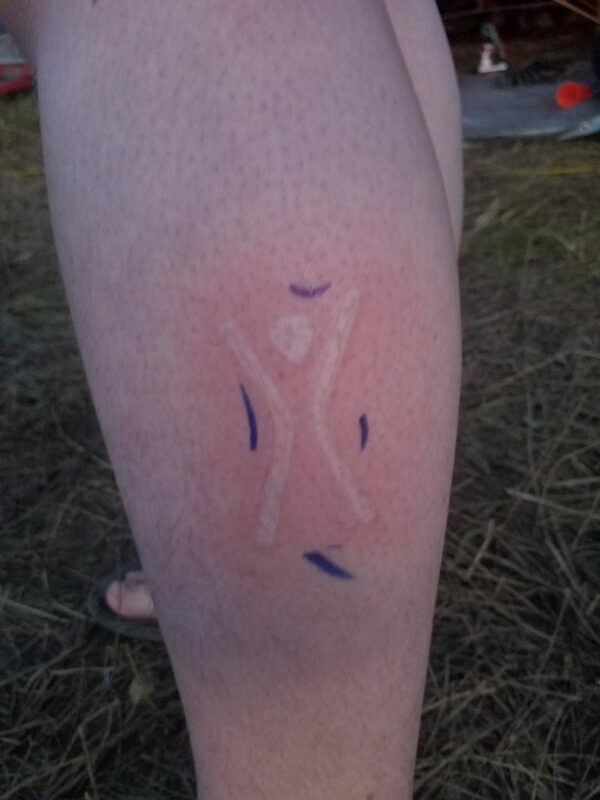 By the next morning, I was surprised by how much less it hurt. My friends at the medical tent changed the bandages for me in the morning and then I went home from the burn in the afternoon and picked up more supplies to take care of it at home. I didn’t want to use burn cream or even neosporin in the long term because obviously I wanted it to scar, but I also didn’t want it to dry out and crack and ruin the nice clean lines, so I decided to use petroleum jelly on it going forward. That night, I changed the bandages myself for the first time. It was totally blistered but completely painless, which kind of freaked me out, but I guess I burned off all the pain receptors! Day 2. Most of the blisters popped in my sleep the second night. Pain was starting to come back at this point, although it still wasn’t as bad as I expected. 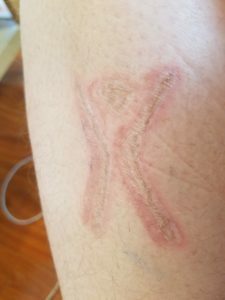 I could see the burn itself starting to scar a bit, underneath the mostly-deflated blisters, and it was mostly the non-injured skin next to the scar that was really red and angry. Day 3. Pain and feeling still coming back gradually. A little bit of ballooning still in the blister but I think this was the last day of any of that. Skin around still getting redder. Day 4. This was the worst day of pain for me. The pain while it was healing was much less like the searing that happened when I got it done. It was more like a dull achey pain in the entire area. Touching it wasn’t too bad, as long as I was careful, but it hurt to put weight on the leg while I walked. Bandaging it definitely helped! I was trying to strike a balance with how often I bandaged it and how often I let it air out. By day 4, I was seeing a little bit of blood right around the edges of the burn, but the lines were still very clean. Day 6. Super happy with how it was looking at this point. After day 4, the pain started to slowly fade and I was leaving it uncovered more and more as it felt better. Day 7. Because I was leaving it uncovered more, the scar was starting to dry out and I began getting worried about it cracking – and messing up the lines! Started using the petroleum jelly again at this point. Day 10. Everything was going well! Pain levels were down, the petroleum jelly helped with the dryness and the scar continued to scab over. 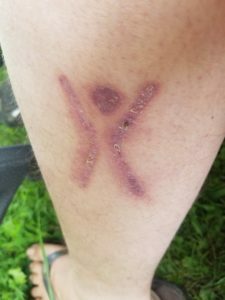 It was starting to get a little itchy at this point, but people had warned me that it would get very itchy during the healing process and to be honest, I never experienced anything more than mild itchy. 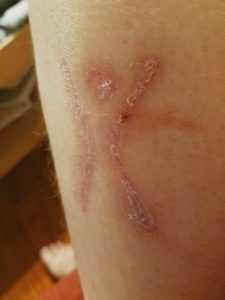 Around day 10, when I scratched or rubbed at it, pieces of the scab started to flake and fall off on their own. The brighter red in this photo was where the scab had already fallen off and those areas were a bit more sensitive to the touch, pain-wise. Day 13. Second round of scabs as the parts that had fallen off re-scabbed over. 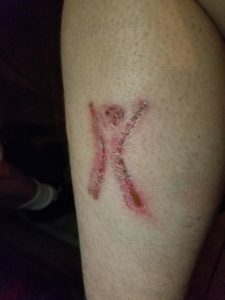 From the few people I was able to chat about branding with, it seemed like some people preferred to pick the scabs off and re-open the wounds to make it scar more and others just let it alone to heal naturally. I hemmed and hawed about this a little but ended up letting it heal mostly on its own. Day 17. One side healed much faster than the other side and was already pretty much smooth by that point. The side with the scabs was really hard like a shell. It had been pretty much painless for about a week at this point. Day 18. I got sick of the hard-feeling scabs and carefully peeled them off. They bled a little bit and it was sore for the rest of the day but it was still a relief to get rid of them at that point. Day 20. Turned purple and started looking more like a bruise, but was nearly smooth and not really reacting to much anymore. Been painless ever since the soreness when I peeled the scabs. It stayed in this state for a long time, with a couple small scabbed/dry areas that weren’t quite smooth, and the purple faded very slowly to like a pale red. I kind of stopped taking pictures of it at this point because it was pretty much stable! I considered myself pretty much healed at this point. Day 20 was also the first time I went swimming since I had it done, since I was told not to swim until it was healed, but it seemed fine at that point. Day 34. Even though I had pretty much already considered myself fully healed for the past couple weeks, since I was confident I was past the point where I had to worry about any complications, I remember that this was the first day it felt completely smooth, like there was no scabbing or dryness at all! 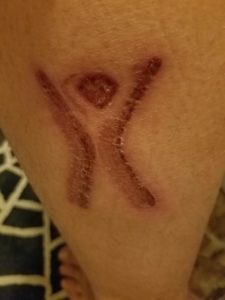 The brand has fully integrated into my skin and is a part of me now! I hope that this personal account was helpful! 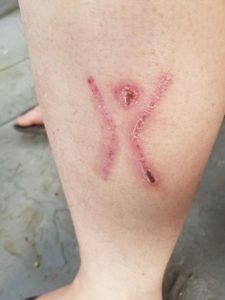 I’ve heard some horror stories about brands getting infected and becoming dangerous, but I was confident that I could do it safely if I was careful and I wanted to try to help others be safe and careful too. 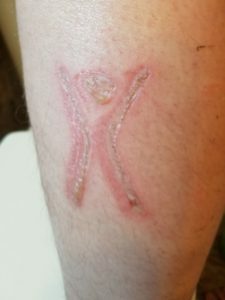 I had wanted to get branded for years and I don’t regret it at all! My main worry during the healing process was that it would heal too well and not look as dramatic as I’d hoped, but it looks great and I love my brand. I’m looking forward to watching how it continues to heal and fade as the years wear on, although I hope that it stays visible for a good long time! I’m proud of myself for overcoming my fears and getting the brand I always wanted and I’m happy to have an unusual and striking body mod piece to show for it!